The original Apple iPhone, that later went down in history books as the iPhone 2G, went on sale on June 29 2007 but was announced 12 years ago on January 9 2007 at Macworld. Since then we’ve seen 11 more generations of iPhones – the iPhone 3G, the iPhone 3GS, the iPhone 4, the iPhone 4S, the iPhone 5, the iPhone 5S/5C, the iPhone 6/6 Plus, the iPhone 6S/6S Plus, the iPhone 7/7 Plus/SE, the iPhone X/8/8 Plus and finally the iPhone XS/XS Max/XR. This is arguably the best known smartphone family ever, but there’s always something to add to the picture and just to prove that here come the latest infographics. One of those focuses on the bill of materials and the other tracks the key iOS updates and the price of Apple stock through the past twelve years. For instance the first-gen iPhone cost about $217 to make and was priced $499 for the entry-level 4GB model – that’s an estimated markup of 129% for the phone that sold around 1.4 million units. 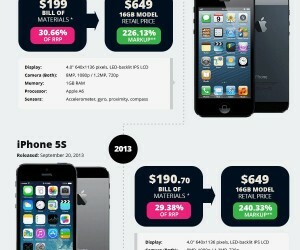 The iPhone 3G cost less to make and more to buy but it was regardless a hit – 11.4 million units sold globally. 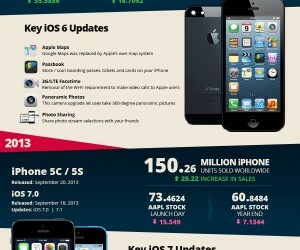 Check out the full infographics for your fix of iPhone nostalgia.